Do you have a person in your life who asks what you want for Christmas, and no matter how obscure the item, goes out and ruthlessly discovers it, no matter how long it takes or what it costs? Well, that is the perfect description of my sister-in-law, Ann. I think she really enjoys the hunt and has given me in recent years a beautiful irregularly shaped soup bowl and a square serving platter, perfect as photo props. Also the Golden Door cookbook, which has inspired my photography and recipe writing. This past year she gave me the OXO Mandoline, a beautiful tool I have been dreaming about for years. 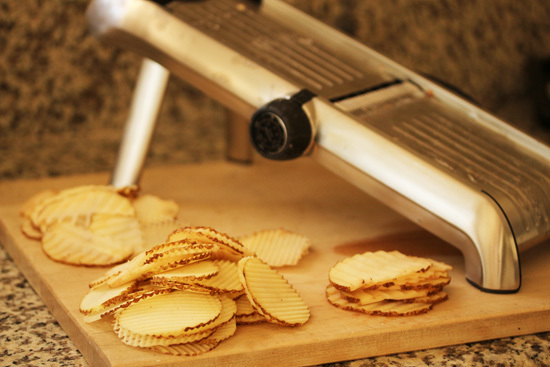 This mandoline has a really cool feature: a waffle cut setting. I was really excited to try it and see if I could make some interesting looking gaufrette potato crisps. I didn’t want to deep fry them because of the fat factor, so I decided on the oven method. The slicing part is fun and I tried various thicknesses and blade options until I got evenly cut specimens. After slicing I tossed them with a little olive oil and salt, and put them in one layer on a parchment lined baking sheet. They roasted at 425 degrees about 12 minutes, turning over half way through. Sprinkle with a little more salt and enjoy. 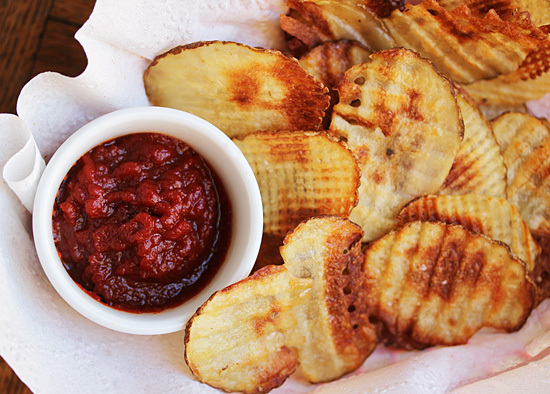 The main reason I made gaufrette potato crisps with my new mandoline is because I had this bottle of Traina Sun-Dried Tomato Ketchup I wanted to try out. Our family only uses Heinz ketchup on French fries; any other brand would be met with you’ve got to be kidding, I’m not eating that rejection. I mean we are die-hard Heinz people. But Sun Dried Tomato Ketchup, now that was intriguing. It tastes like the richest sun dried tomatoes, thick and intense. I loved every bite of the potato crisps with this tomato essence. 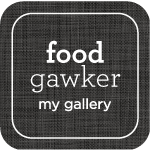 And now I’m thinking how else I can use it, like in vinaigrettes, or mixed with the mayonnaise in potato salad, on crostini with toppings, or slathered on grilled chicken breasts. Traina suggests using it on sausage, steak, meatloaf, eggs, tacos, panini, and burgers. Are the light bulbs going off in your head? It takes 4 pounds of vine ripened, sun-dried Roma tomatoes for each 16 oz. 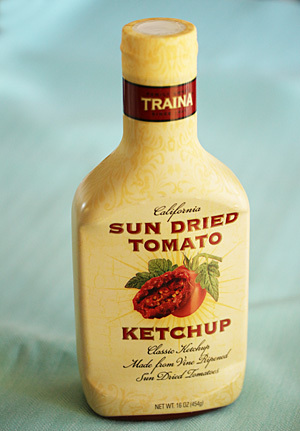 squeeze bottle of Traina Sun Dried Tomato Ketchup. You can go to the Traina website and see how sun-dried tomatoes are made, which is really interesting, and for more recipes. Right now in California, you can buy some of this amazing Ketchup at Bel Air Mart, Gelson’s, Rayey’s, Nob Hill, Mollie Stone’s and McKay’s, and they will be expanding nationwide this spring. Traina Foods provided me with the Sun Dried Tomato Ketchup to try out. 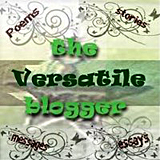 I was under no obligation to write about it. It is awesome, which is why I’m sharing it with you. I’m with Greg. Have been very afraid of playing the mandoline. Wow, such beautiful results though, and you still have all fingers, I hope!